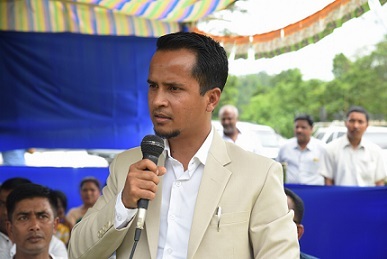 Meghalaya Revenue & Disaster Management Minister Kyrmen Shylla on Tuesday sent a loud and clear message to the people of Ampati Legislative Assembly constituency that the coalition government in Meghalaya formed with the United Democratic Party (UDP) with the National People’s Party (NPP) and other partners will last full term. “Don’t dare to even think of breaking our relationship with the NPP and others. We are not scared of the Congress party. We will stand together and ensure progress and prosperity for Meghalaya,” said Shylla addressing election rallies at Murchapani and Garabokmangre areas under the Ampati Assembly constituency. Tuesday’s high-voltage election rallies of the NPP saw presence of Meghalaya Chief Minister Conrad K. Sangma, Community & Rural Development (C&RD) Minister Sniawbhalang Dhar, Government Chief Whip Agatha K. Sangma and a host of other party functionaries from Khasi and Jaintia Hills, who are all out to drum up support for NPP candidate Clement G. Momin. 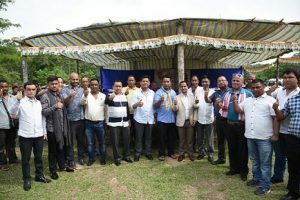 For the past one week, NPP and its partners in the Meghalaya government are camping in Ampati Assembly constituency to woo the voters to unite with the NPP and break the Congress in Ampati, a stronghold of former Meghalaya Chief Minister Mukul Sangma. “The by-election is very important for the NPP as this will demonstrate that Ampati is ready to embrace change and the people here are willing to be in the ruling side,” said Chief Minister Conrad K. Sangma. 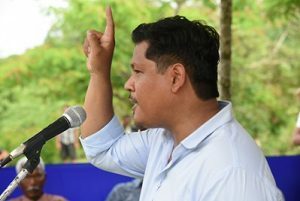 UDP leader and Meghalaya Revenue & Disaster Management Minister Kyrmen Shylla, who is first-time MLA and the youngest minister in Chief Minister Conrad K Sangma’s team, also addressed election rallies to seek support for NPP candidate Clement G. Momin.